The songwriter's journey is two-fold, a path that moves inward toward the self and outward to embrace the wide world, coming full circle in the final, compressed form of a song - three or four minutes of exquisitely crafted sound that speaks to our better angels, and sometimes our not so better. Music is the soundtrack of the lonely soul's reckonings. It is a hard-won melody, a poetry conjured and charted and breathed forth into thin air like a celestial map of laughter and tears, love and loss. And hope. 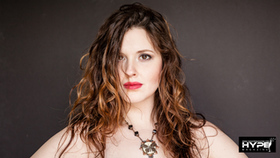 In a very real sense, singer/songwriter Halie Loren has come full circle. Her latest album, From the Wild Sky, is not just the culmination of a recent flurry of work but, in fact, the culmination of years making music. As her first collection of original songs since her debut album, 2006's Full Circle, the new album represents a maturation that is also a return to the deepest roots of her creativity. 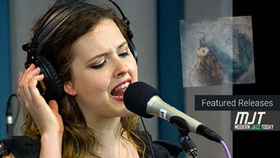 Loren's decade-plus career, represented by nine excellent albums and an international reputation as a top-notch musician and gifted vocalist, has led her exactly to this moment in time. Among the innumerable pleasures to be had here is the rare joy of hearing an accomplished songwriter fully spread her wings. 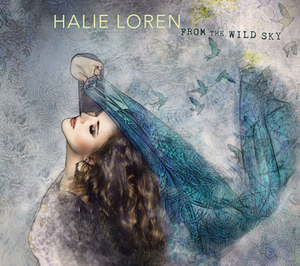 From the Wild Sky captures Loren soaring - confident, embattled and empowered, ever attuned to the healing powers of music in these troubled times. Each song tells of a journey, and the sum total of the album itself represents a voyage that beckons the listener to travel along, through fragility and conflict into a tenuous but graceful acceptance, grounded in wisdom and celebrated with stunning artistry. From the opening number, the wake-up call of "Roots," Loren issues a challenge over the snap of perfectly orchestrated pop: "When you finally open up your eyes/ Will you love what you've found?" The song, with its swelling chorus and cathedral harmonies, is a statement of intent, signaling a cycle of songs that burrows inward for kernels of truth before blossoming forth to confront the world anew. Take, for instance, the infectiously catchy "How to Dismantle a Life," an upbeat and wickedly smart tune about properly ending a bad relationship, and perhaps the most unbowed divorce anthem ever written. Similarly, the deep New Orleans groove of "Paper Man" finds Loren shining a wry light through the facade of flighty people who hide behind the fakery of a "free spirit." On songs such as these, Loren traipses the tripwire of anger, turning her disillusionment into defiance and self-respect. Nature, and the natural world, has always featured significantly in Loren's songwriting. As a child growing up in Alaska, and then as an adult in the Northwest, her wonder and gratitude for the gifts of the great outdoors have inspired a reverence and communion she brings forth in song. In the gentle sway of "Wild Birds," Loren gazes with a child's eyes upon the surrounding landscape, until the bigness of everything overwhelms her with a humility that is equal parts benediction and elegy ("Are we the only ones who don't understand/ We're but shadows upon an eternal land?"). On "Noah," the album's emotional and artistic centerpiece, nature itself becomes a complex metaphor for loss and hope, as apocalyptic visions of a devouring flood are brought to the level of two lone stowaways seeking safety in a deluge. A gorgeously pained lullaby, the song whispers its fears like a survivor huddled for shelter, while the whole world falls apart. "We are temporary lights shining in the deep wild sky," Loren sings, "holding everything and nothing but the glow we emanate." Fragility and defiance walk a delicate tightrope act throughout this lovely album, the sign of a musician operating at a peak level of sophistication and, yes, risk. Part confessional and part invitation, From the Wild Sky is a testament to Loren's indomitable spirit, as well as her ability to craft her experience into something at once personal and universal. From the Wild Sky, Loren's most intimate and layered album, is also her most accessible; each successive listen opens up vistas of meaning. Loren's began her career as something of a prodigy at age 13, when she won a songwriting contest, gaining national attention. Before she was 19, she did a stint in Nashville, soaking up that city's ancestry of great American songwriting. She recorded her first album at 20, and from there she was off and running, recording successive albums that garnered awards, Billboard recognition and an international following that has sent her touring around the globe, including stops in Korea, Africa, Japan, Canada and the Caribbean, to name a few locations. Her records regularly make "best of" lists, and her sublime talents as a vocalist are attested to by several albums hitting the #1 slot on Canadian and Japanese jazz charts. Considering such success, it would have been understandable for Loren to toe the line and stick to the known path with her new album. Instead she chose to take a leap of faith, forging ahead with a vision that encompassed the full complement of her compositional talents. Funding her latest efforts through fan pledges to a Kickstarter campaign, she teamed up with producer Troy Miller (Gregory Porter, Laura Mvula, Jamie Cullum) and a handful of all-star musicians, including Femi Temowo, Ben Williams, Michael Olatuja, Nathan Schram, Andrew Yee, and Becca Stevens (featured on the track "Wild Birds"). From the tenements of Tin Pan Alley to the backrooms of Nashville, songwriters have drawn our cosmos, each tune a pin in the atlas. They tell us where they've been and where we're going. They stick in our craw. They sing us awake, lullaby us to sleep. They move our feet. With From the Wild Sky, Loren steps full force into this great tradition, offering a gorgeous collection of songs pulled forth from the innermost places of being. Authenticity and connection have been essential roots of the artistic growth of Halie Loren. The result is art in an eclectic form, with soulful compositions reflecting wounded defiance, stubborn love and hard-earned hopefulness. Her voice connects to the soul of her song writing, reminding us that there is always beauty to be found, even in the most painful experiences. That powerful personal connection is the driving force behind From the Wild Sky, Halie's latest and most ambitious album to date.